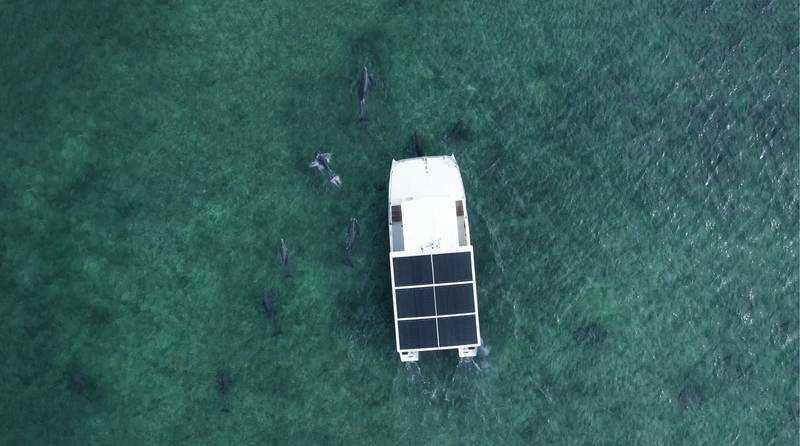 Deep in the blue waters of Key West, Honest Eco's founding captain, Billy Litmer, said its dolphin watching tours help their guests "understand and interact with wildlife from a curious yet courteous proximity." His boat is called Squid, and Billy built it from the hulls up. He asked David Walworth, an MIT educated boat designer and builder, to design the perfect boat for the dolphin watching excursions. 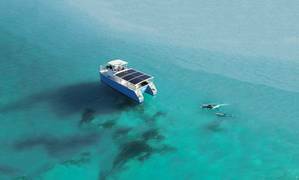 Walworth suggested that the multihull boat would be a great platform for going electric. The combination of the Sunflare panels and the lithium batteries make electric propulsion possible-and accomplishes much more than the usual 12-volt battery that runs the lights and radio and other small onboard electrical needs. Squid has two BMW i3 batteries. That's about 1200 pounds of lithium ion battery. That meant the solar panels themselves had to be light. The12 custom-sized modules produce 2000 watts of power and weigh as little as 120 pounds combined; or 25% of the weight of traditional solar panels. Squid is a one-of-a-kind vessel. It's the first of its kind plug-in, lithium ion battery-powered, hybrid charter boat with purely electric motors. Electricity is stored in the batteries, which can be recharged from shore power, the Sunflare panels, or when the dolphins are hard to find, a top EPA tier diesel range extender generator. When the dolphins are easy to find the boat will often not require any use of the generator on the second trip of the day, running purely on battery and solar. It's also one of the first near-coastal hybrid catamarans to make it through the challenging United States Coast Guard certification process. Billy said, "there was not much precedent for getting this boat certified. There was no rule book." He said on a few occasions they'd work for weeks on the boat just to have the Coast Guard ask him to rebuild what they'd thought they had finished.